The University of Manchester is committed to supporting postgraduate research students via a range of funding opportunities. At Manchester, we understand the importance of developing academic talent and rewarding high achievement and hard work. We therefore invest significantly in funding and offer a range of generous research studentships and scholarships which are available to international, UK and EU students. The School of Computer Science is highly successful in attracting funding for research students. Funding normally covers full payment of tuition fees plus a stipend for living expenses. The amount awarded is specified for each individual project. If you are interested in applying for funding please read the criteria very carefully to ensure that you are eligible for consideration before you apply. Applicants must have an academic offer for a place on the PhD programme in place by the closing date of relevant funding opportunities. The University of Manchester's President's Doctoral Scholar Awards (PDS Award) for September 2019 entry is open to all nationalities and research areas. In order to be considered for this funding, applicants must already hold an offer for a place on the PhD programme. The School will nominate offer holders for consideration - you are therefore considered for this funding automatically and do not need to apply seperately. Within the Faculty of Engineering and Physical Sciences, PDS Award funding will be allocated to our most outstanding applicants seeking PhD training opportunities. Criteria: Applicants must have obtained (or expect to obtain) a minimum first-class honours degree (or equivalent), and ideally hold a Masters-level qualification at merit or distinction (or equivalent). They should also have a track-record of engaging with research. This may include contributions to publications/articles, promoting their research to a wider audience, prizes/accolades for previous research work, setting up research collaborations with other groups etc. Closing date: 10 December 2018 for September 2019 starters (In order to be considered for this funding, applicants must already hold an offer for a place on the PhD programme. The School will nominate offer holders for consideration - you are therefore considered for this funding automatically and do not need to apply seperately). Applications are invited from outstanding applicants for the three-year Faculty PhD Studentships (Dean's Awards) commencing in September 2019. These are extremely competitive awards and are open to all nationalities and research areas with a lead supervisor in the School of Computer Science. Awards will be made on the basis of evidence of academic ability and research aptitude. Applicants must have obtained (or expect to obtain) a minimum first-class honours degree (or equivalent), and ideally hold a Masters-level qualification at merit or distinction (or equivalent). They should also have a track-record of engaging with research. This may include contributions to publications/articles, promoting their research to a wider audience, prizes/accolades for previous research work, setting up research collaborations with other groups etc. The University of Manchester is offering a Research Impact Scholarship for September 2018 entry. Awards will be made to exceptional candidates who undertake research in the following areas: Discovery, Energy and Sustainability, Graphene and Enterprise, Global Inequalities or Healthy Futures. The Scholarship will be for a period of up to 3 years and will provide a stipend of £14,000 per year. The successful candidate would be expected to register on the PhD programme in Seprember 2018. Applications are invited for this fully funded (tuition fees plus additional stipend), full-time PhD EPSRC iCASE studentship, to start in September 2019 or as soon as appropriate. It is intended that this studentship is part of a newly established partnership between the University of Manchester and the BBC R&D Labs. This project is a partnership between the School of Computer Science at the University of Manchester and the BBC and it focuses on the application of Natural Language Processing techniques for the construction of knowledge graphs which can support journalists in complex analytical tasks. The project explores the application of state-of-the-art machine learning techniques for discourse analysis such as story/narrative extraction, argumentation mining, opinion mining. Find out further information about the project. Applicants should have or expect to obtain a BSc 1st Class or MSc with Distinction in computer science or a related discipline and should have strong programming skills. Experience in Natural Language Processing and Machine Learning projects are highly desired. Applicants must also have British citizenship or be a permanent resident and have lived in the UK for the last 3 years. Exceptional EU students may be eligible. Deadline for applications is 6 April, 2019. Qualified applicants are strongly encouraged to informally contact Andre Freitas (andre.freitas@manchester.ac.uk) or Chris Newell (chris.newell@bbc.co.uk) to discuss the application prior to applying. Please submit a full application via the standard application route. The James Elson Studentship provides an outstanding candidate with fees and a stipend to undertake a 3-year PhD research project relating to applications of computer science in a specific area of research. The James Elson Studentship for 2019 entry is in the field of Artificial Intelligence or Biohealth research. The studentship is open to UK/EU nationals eligible to pay ‘Home’ fees, for full-time study. Candidates will be shortlisted for interview on the basis of academic quality and their preparedness for their chosen project as evidenced in their application. References and supervisor support will also be sought when shortlisting. Funding is available for UK and EU nationals for the 3 year PhD programme. The School Studentship pay all tuition fees as well as a stipend award for 3 years. Applicants must be eligible to pay 'home' fees. There will sometimes also be an opportunity to undertake teaching in the form of laborartory demonstration work in order to supplement your income. In order to be considered you must have an academic offer in place for a place on the PhD in Computer Science. Further details outlining the application process can be found here. The School has a number of full fees studentships and partial fees contribution awards available to suitably qualified international PhD candidates. The full fee studentship will pay the international fee for the duration of the programme (with the exception of the writing up year). And the partial fee awards will pay the difference between the full international and home fee level each year over 3 years (approximately 75% of the full international fee). The School cannot make any contribution towards living expenses and the University must be satisfied that the applicant has sufficient external funding to support the required 3 years of study. Potential awardees will be considered on a rolling basis from September - March so it is important that you apply for the PhD early. Applicants will be intereviewed in person or via Skype by the funding interview panel. Funding: For successful applicants, The University of Manchester will cover their full tuition fees for the period of the relevant programme as outlined in the offer letter (usually three years). CSC will provide living allowances as prescribed by the Chinese Government, and will cover the round-trip international airfare for students from China to the United Kingdom, visa and passport application fees. 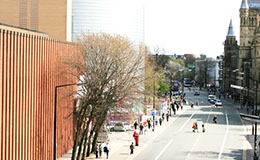 Candidates must hold an unconditional offer from The University of Manchester. They must fulfil the relevant academic entry requirements set by their chosen School at The University of Manchester, including a high level of English language proficiency. 1.Candidates should submit an online application for admission to The University of Manchester before January 2019. Candidates should specify in their application that they wish to apply for The University of Manchester/CSC joint scholarship scheme. All supporting documents (degree certificates, transcripts, research proposal, references and evidence of English language proficiency (if required) must also be provided with the application. Other additional documents may be required by the School including CV and personal statement which will be advised by the admission officer in the School. 2.The University of Manchester will evaluate the candidates, upon receiving applications and rank them in priority order. The University of Manchester will provide CSC and each qualified candidate with a copy of the offer letter. The UK government has confirmed that new doctoral loans will be available for those studying PhDs (and equivalent doctoral programmes) from 2019/20. UK and EU nationals who are ordinarily resident in England, aged 59 or under, who are not already receiving funding via a UK Research Council, are eligible to apply. For further information on eligibility criteria please visit: https://www.gov.uk/doctoral-loan. Additional information will be published to this page once further information has been confirmed by the UK government. A summary of the main features of the loan is available on FindaPhD.com. Below is also a list of organisations which offer funding to students of specific nationalities or gender. If any further information is required such as eligibility and criteria details please contact the organisation directly. There are many other organisations not included in this list that maybe able to offer support. Students should apply directly to the relevant organisation. LPDP Funding Indonesia - Full funding for students with Indonesian nationality, graduated from an accredited Indonesian university or an overseas university acknowledged by the Indonesian Higher Education Directorate (DIKTI), maximum age 40 (for PhD programme). UK-India Education and Research Initiative - UKREI. This is a major government funding initiative supported by the DfES, FCO and OSI. British Chevening Scholarships - These scholarships are prestigious awards funded by the UK Foreign and Commonwealth Office given to students for study in any subject area but preference is given to postgraduate students or those with an established career. Commonwealth Scholarships - Postgraduate scholarships for Commonwealth students administered by the Association of Commonwealth Universities (ACU). Fulbright student Scholarships - Applicants from the United States can apply to the US-UK Fulbright Commission for a Fulbright Award. British Marshall Scholarships - Scholarships for high calibers graduate students from the US to study in the UK. British Federation of Women Graduates - Scholarships available for female postgraduate research students. Croucher Foundation - Scholarships for Hong Kong born students. Global Education Program (GEP) - Russian government funding program that offers Russian citizens an opportunity to study at leading foreign higher education institutions. Henry Lester Trust - Support awards given to Chinese students (including those from Hong Kong) studying for a PhD.